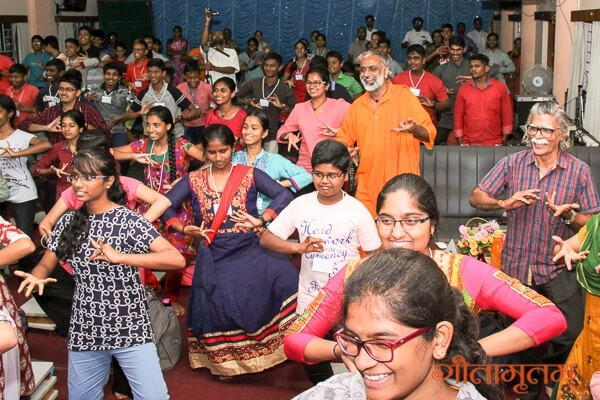 A 5-day exclusive camp called as Gita Mananam was conducted for the students of Gita who had participated in the previous Gitamritam camps. 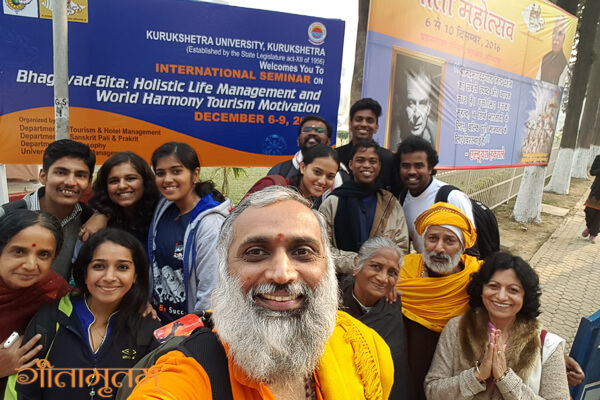 A total of 23 students participated in this camp which was held between 25th Dec and 30th Dec 2016 at Amritapuri. 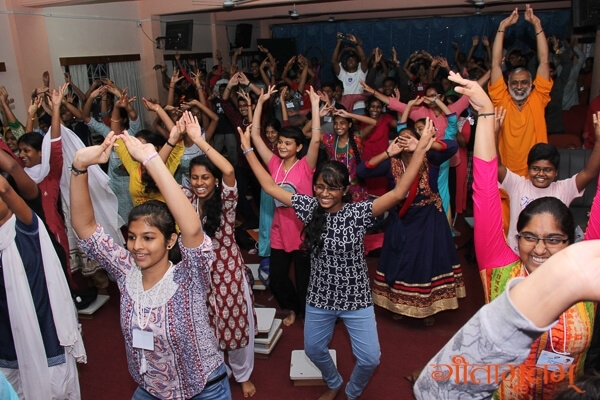 The theme of the camp was ‘Discover your Self”. 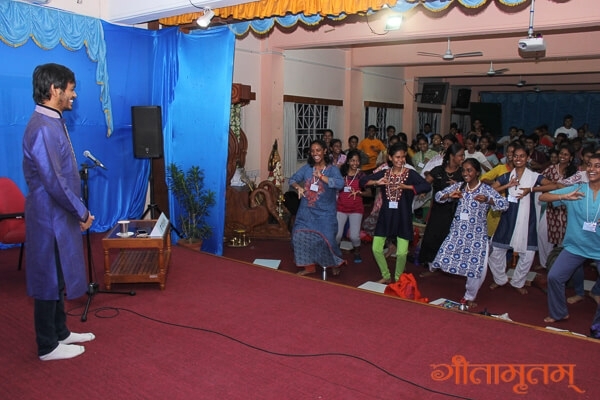 The camp was basically about contemplating the ideas in the Gita and applying the principles in our daily life. 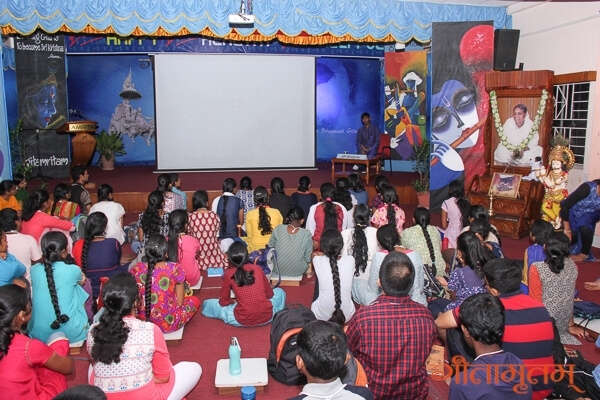 The students were fortunate to learn Gita sitting at the feet of StitaPranja, our beloved Amma. 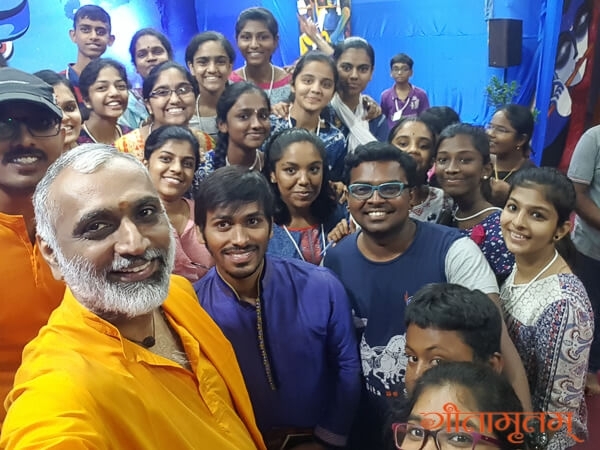 The students got an amazing opportunity to ask questions to Amma connecting Gita and their life and got answers from Amma directly. 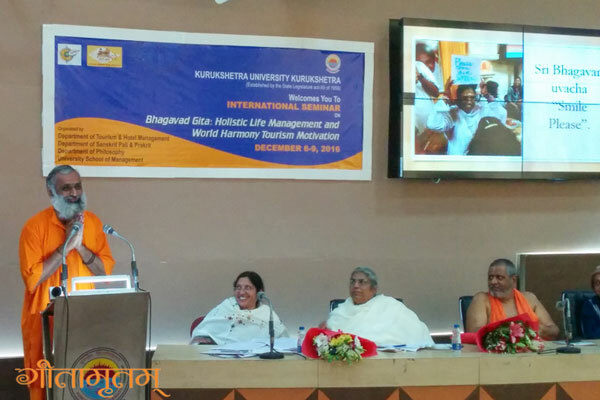 Guest speakers sharing their experiences on the importance of Gita and Guru. 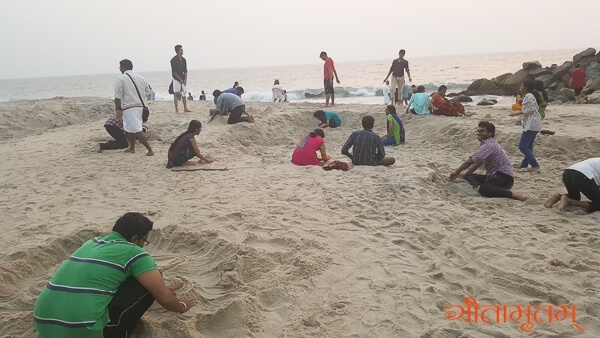 The chapter of this year’s Mananam was Chapter 15, Purushottama Yoga. 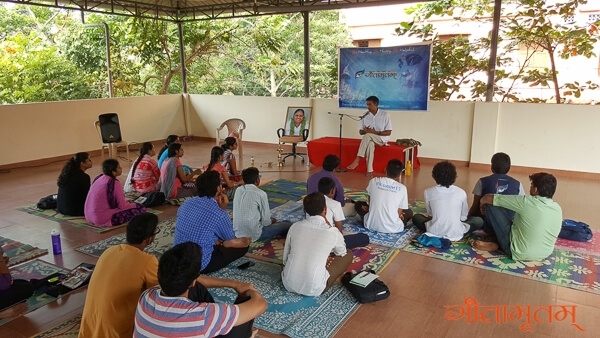 The Gita class was very practical in its approach as it explained about the Purusha that each and every one of us are. 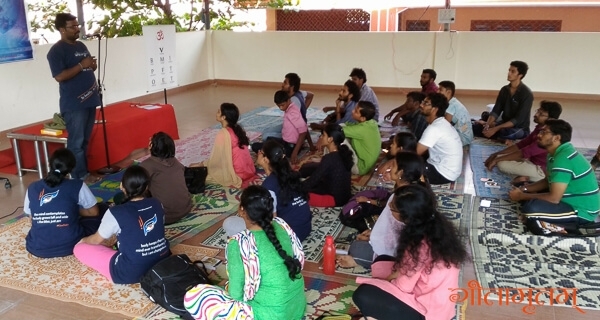 The classes taught that the Creator and Creation are not two, the Jeeva and Iswara are not two and spoke about the ways in which each person can overcome their false identities and discover their True Self. 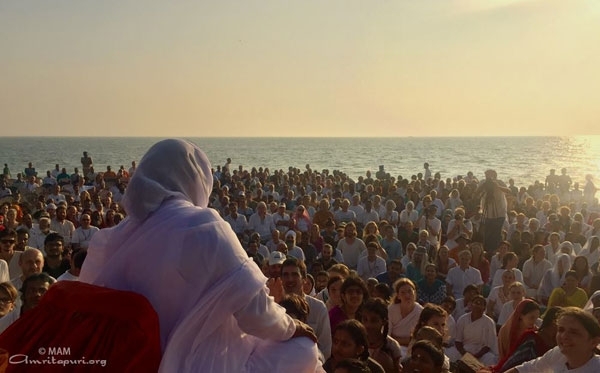 Amma in her Satsang at the beach and in the hall gave an overall summary of the Purushottama Yoga with various examples in which a person could attain the enlightened state. Amma stressed the importance of spiritual practices to purify our minds to realize the inner Self which is dormant and covered with Vasanas. 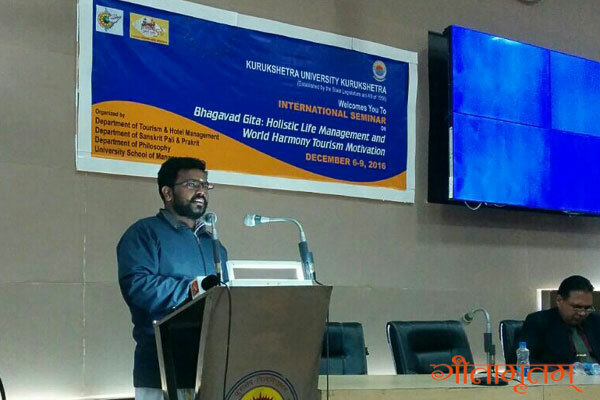 Prof V Shankaran Kumaran led the workshop activities. 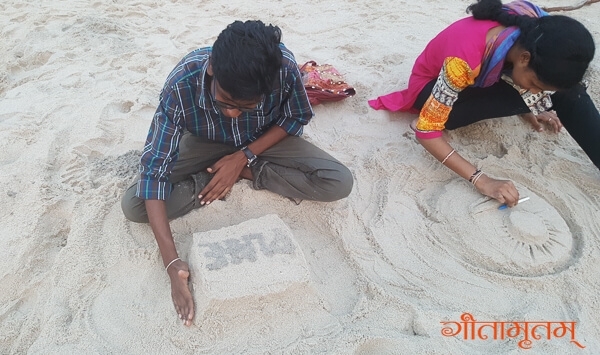 The students were asked to create anything with the sand on the beach. They were given time to focus and think on what they wanted to make. The challenge here was that they had to create with awareness by being in the present moment and anything done without awareness in the present moment will only result in recreating from their past memories. Only awareness can help the students to be creative and Living each moment with awareness will make every experience new. 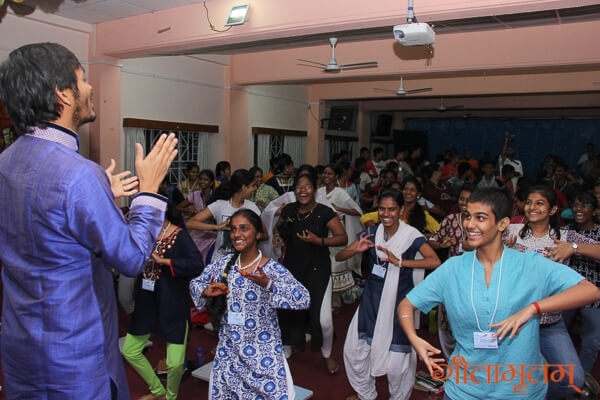 Workshops for overcoming Mana & Moha, removing false identity by replacing their name with “I” and games based upon the concept of Prarabdha were there. 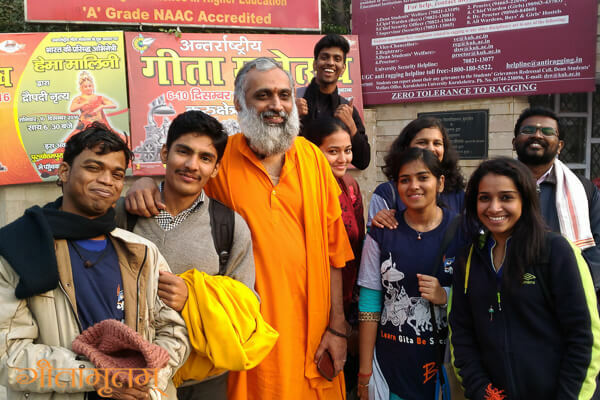 The students were taken to the compost pit in the ashram where they worked across several areas like waste segregation, dumping, feeding the worms, packing etc. 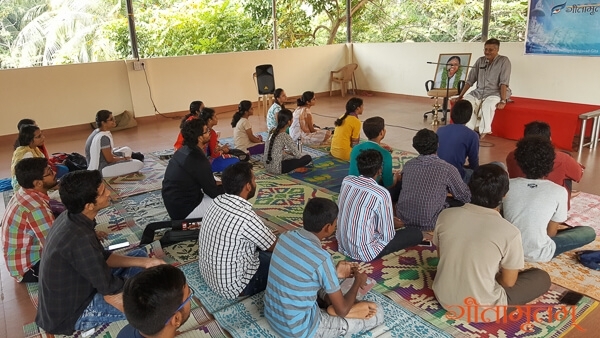 The students learnt about how to convert karma into karma yoga by offering the action being offered at the Lord’s feet. 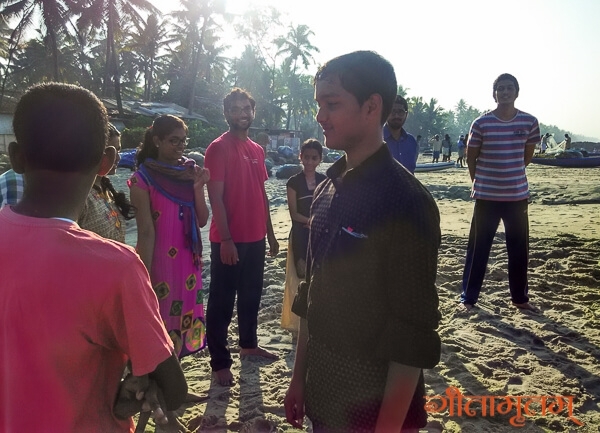 The students learnt about the need for awareness in each and every action that they perform. 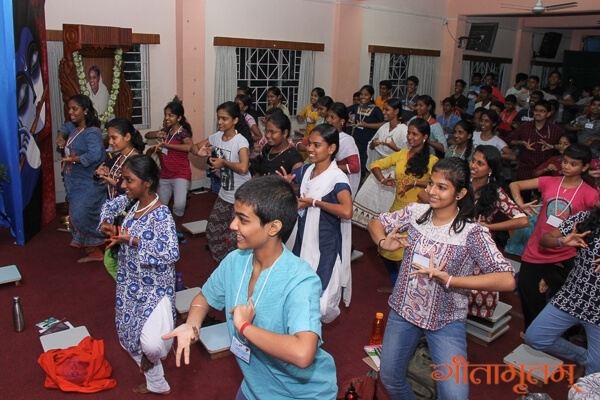 The students also learnt to overcome their likes and dislikes through this seva. 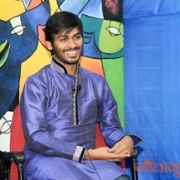 Dr. Hari said that the association a person keeps and entertains has a great impact on his life. We should be wise enough and must discriminate while we are associated with the surroundings. 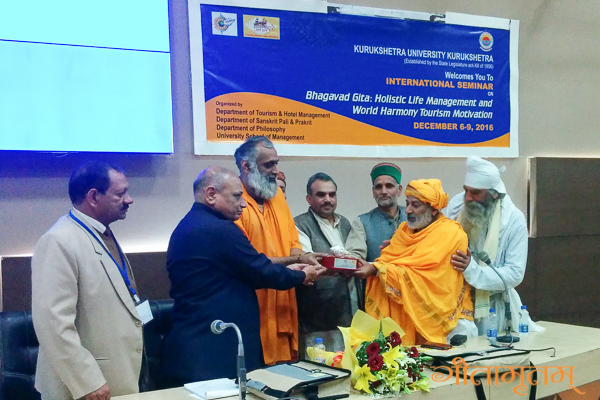 Dr. Hari said, “One should have a part of their mind that remains observing all the situations”. 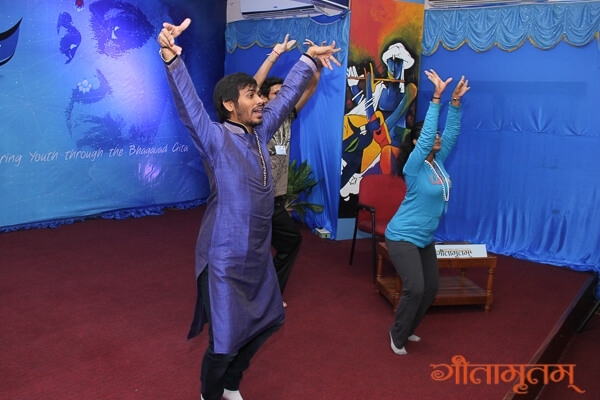 This practice helps a person to detach himself and come closer to the Self. 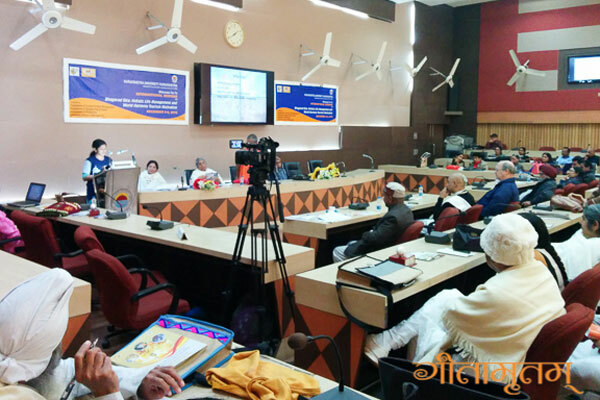 Gurudas Ji shared the importance of adopting the basic principles in life for achieving higher goals. 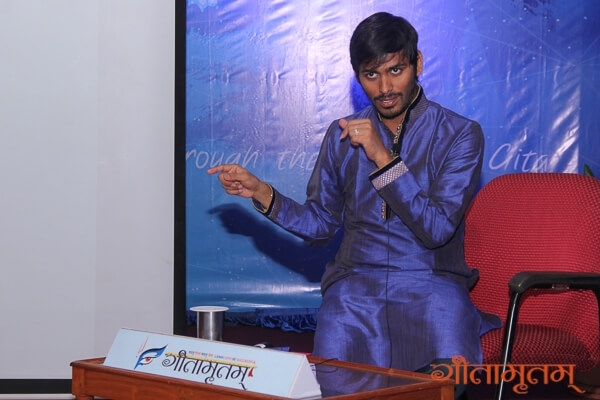 He told a story in which he revealed that Amma knows everything even though it is untold to her. He also spoke on the importance of surrender of action at the feet of the Guru. 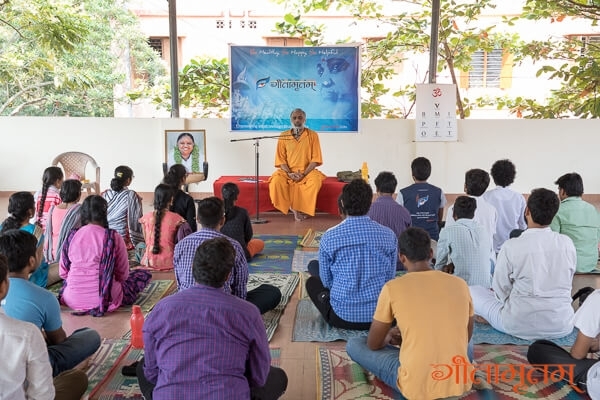 His experience revealed to the students that a strong conviction of the Guru’s words in any situation leads to the correct path. 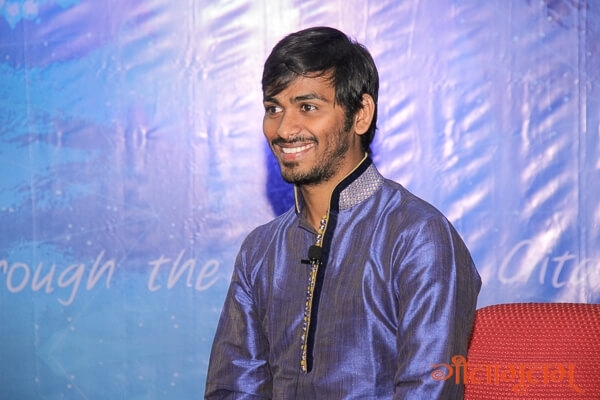 He shared his life’s story on how Amma’s words guided him and helped solve the critical situation in his wife’s life. 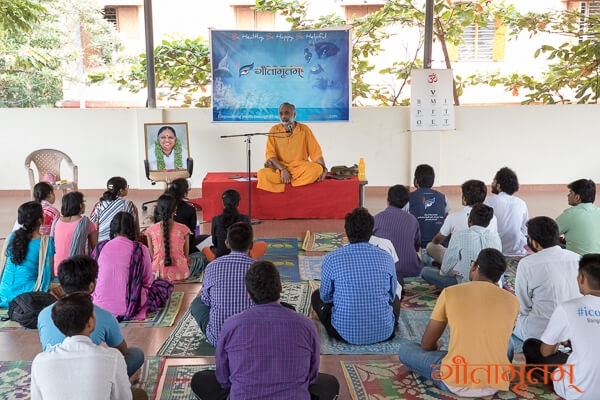 The students learnt about the attitude of conviction and surrender to the Guru and Guru’s words. He told that he used to overeat but Amma’s one statement changed him completely: “If you eat like this, I’ll stop eating”. It shows how the Guru’s words can change the addictions in a person if he loves his Guru. 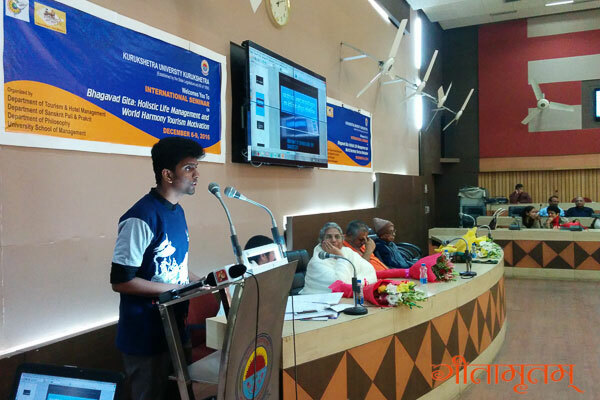 A person who suffers from severe arthritis became a source of inspiration to all the students. She has been with Amma for the past 10 years on a wheelchair. Even though she always need an attendant, she has been travelling with Amma around the world without any assigned person to help her. In these years, she has learnt to find the resources that she needs on her own with full effort. When the Guru says something, it is our effort with faith in the Guru’s words that will bring us what we want. She does at least 8 hours of seva every day. 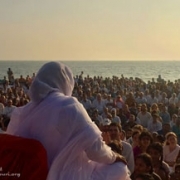 Poornima said, “The first ray of sun in human form I saw in Amma”. 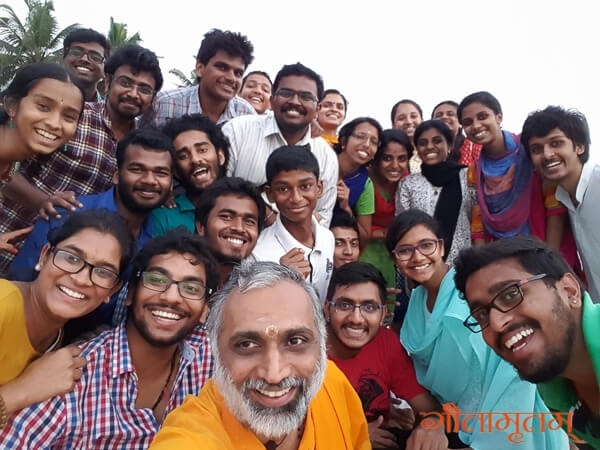 Sai Teja: This camp has made me try to understand who God really is. I want to maintain a part of my mind to be an observer which will not get affected by any situation. And always mind controls us. But we should not let the mind to do so. We should always be conscious of what you are doing and keep the mind calm and know that Guru will never leave you. He is within you and in any situation, he will be there to help you. 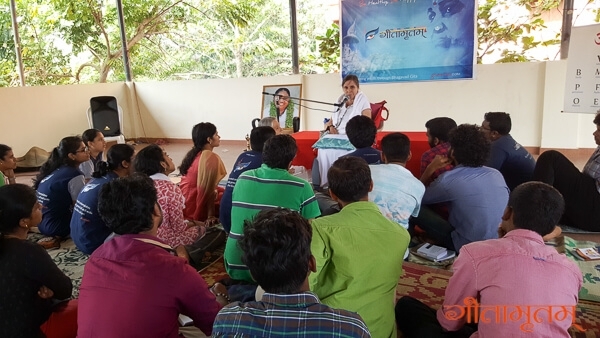 Pramarsha: Until I attended the camp, I had a preconception that each form of god was different in their nature and if I pray to one, the other would get angry with me. But now I understood that every form is the same and even all of us are the same being. 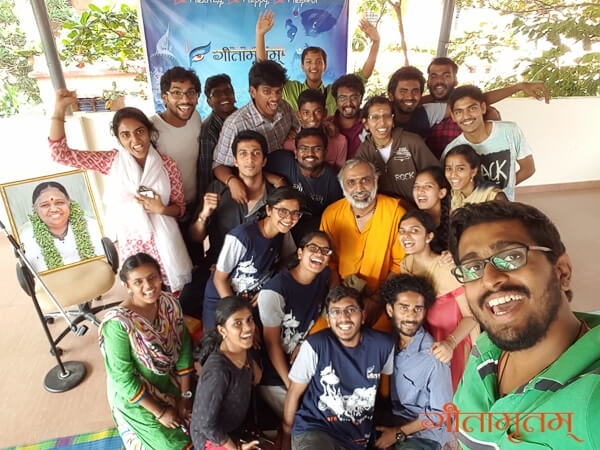 Anudeep: Surrender is the concept that attracted me the most in this camp because this one word could answer many of my questions. You are already surrendered whether you know it or not, whether you do it or not. Nothing is happening according to your will. Just discover that is what surrender is. Thank you. 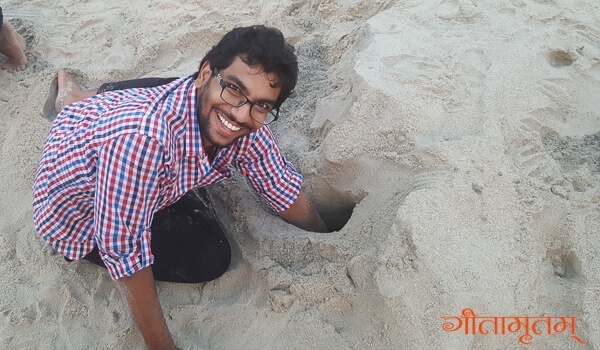 Amrutha Ramakrishna: The most important lesson I learnt from this Mananam is to discriminate between essential and unessential things in life. We have so many good things to do in all of our lives. Why should we waste our precious time in the unessential things? So just filter and extract the best you can get from life. Food plays an important role. If we don’t intake good food it affects our thinking. So we have to take good food and keep ourselves healthy. 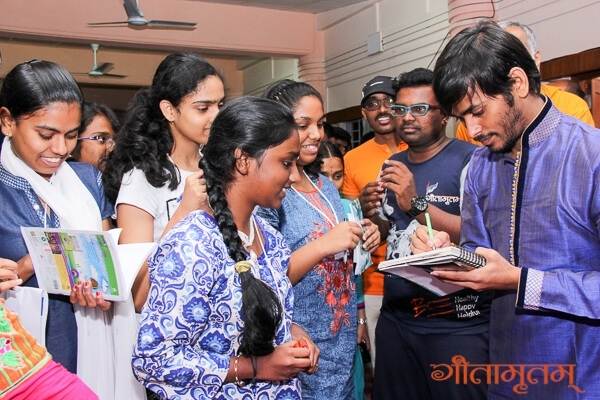 Vasudevan: Experienced the most beautiful thing ever. Was able to disconnect from my physical pain by saying: “I’m not this body”. Not just in words, it became a living reality. The most peaceful and quietest place… It was fully dark, but it was bright. Only bliss. Both mind and body were separate from me. I’m the Atman. All Amma’s grace and leela. One of the most important lessons for a lifetime: If you have faith and surrender toward the Guru, the grace will come. And being attached to the Guru is the best Satsang we can have in our life. 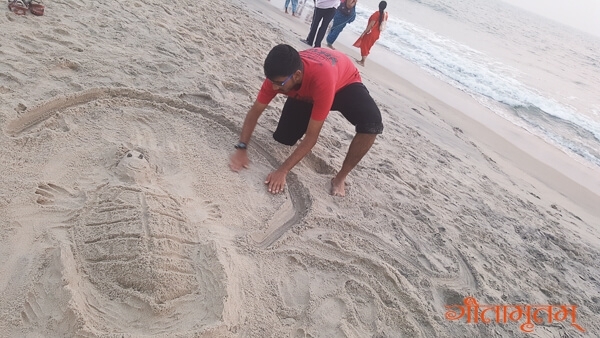 Amma is always with me. It’s up to me to accept that. 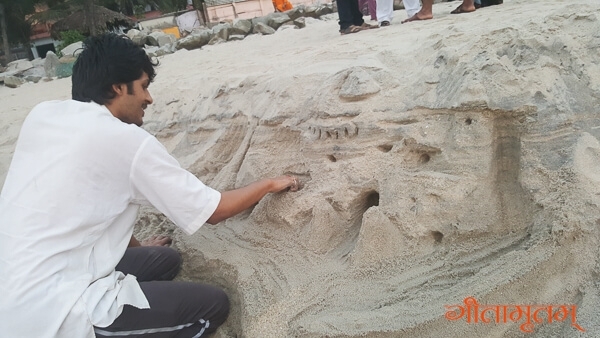 Sai Sunder: Mananam helped Sunder to take that 180-degree turn to look at the self and ask “Who am I?”. 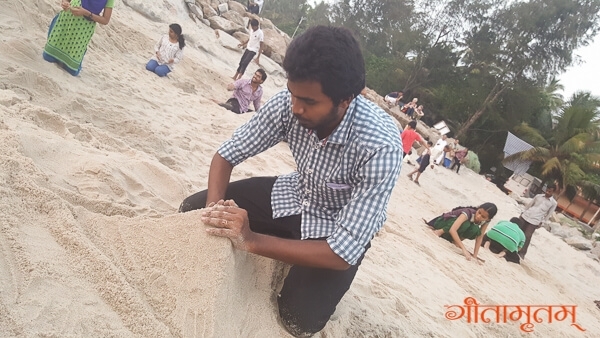 Sunder understood that he is not the body. It’s very easy to get Mana and very difficult to remove the Moha we develop. 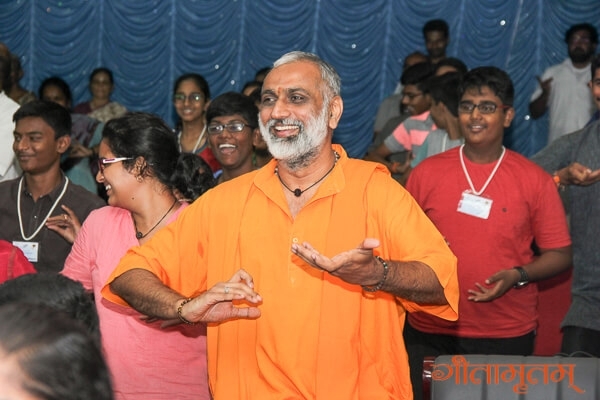 SreeHari: Gita Mananam was a wonderful self-discovery camp. I have also realized that Krishna is within us. SreeHari is so happy that he has realized the truth. 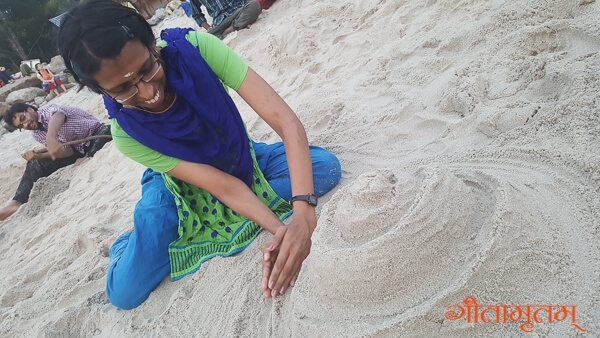 Neeraja Valsan: The main thing I learnt is to control the mind like the way it flows. It takes along with its fragrance and stink. Similarly, we should never get stuck with any thought. 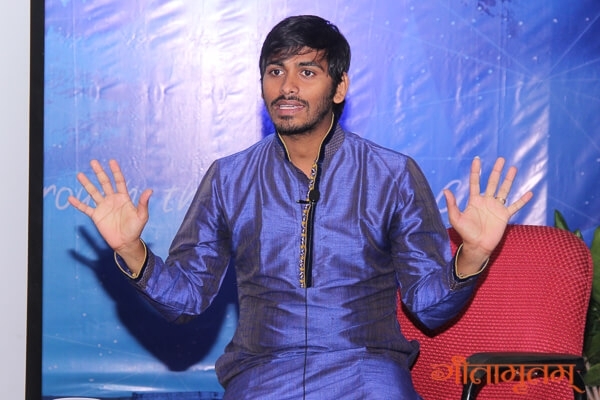 Shankar Kumaran: This camp is completely different from Gitamritam-BALA-YUVA-KALYAN. Could see student’s time conscious, they were not late in the class. Though it was not like a busy schedule, they were so responsible for their actions. 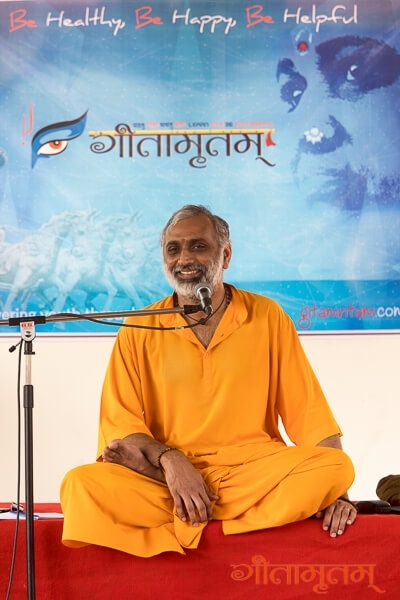 Many things can never be replaced, Living Sri Krishna, Eating with Sri Krishna, Interviewing Sri Krishna, Eternal Ocean, Seva, Prasadam and many more. 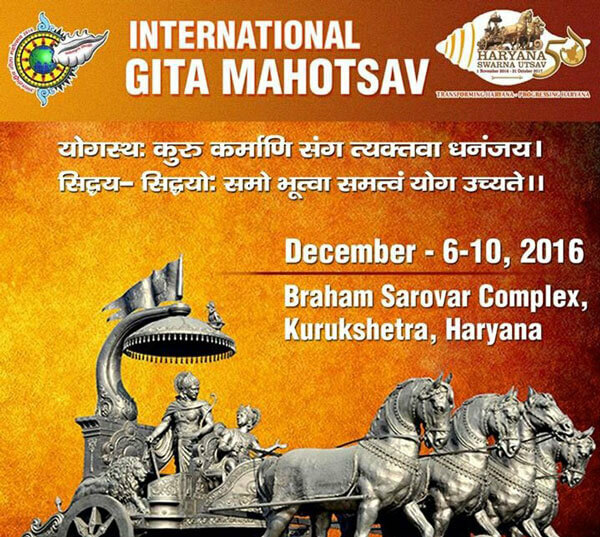 Fifteenth Chapter- A trailer of Gita. 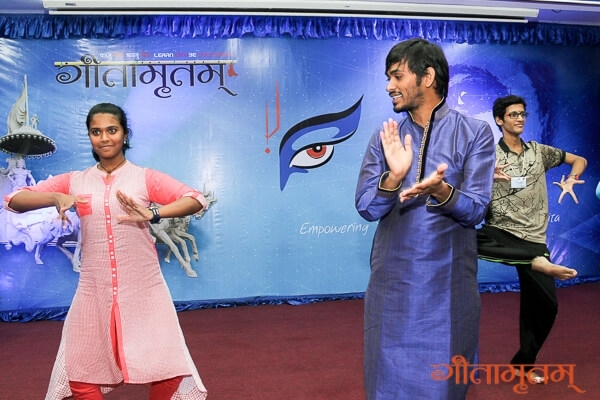 “Nirmaanamoha” shloka was superbly good. 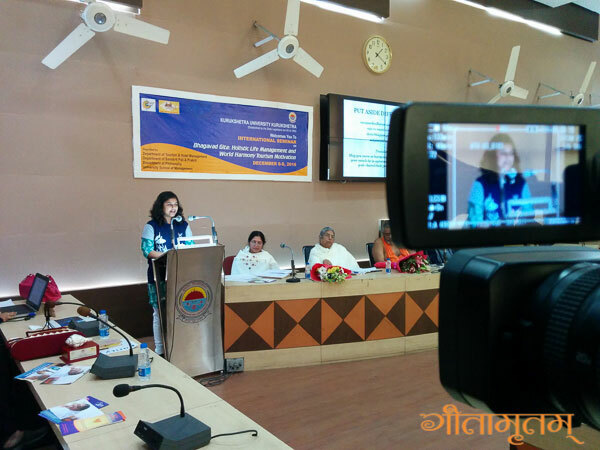 Isn’t learning Gita from book or Internet is enough? 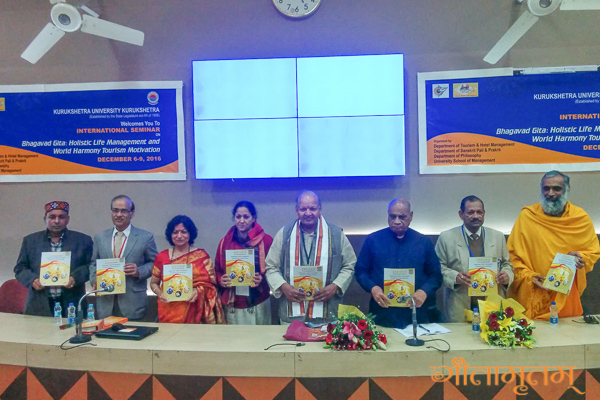 Isn’t learning Gita from book or Internet is more than enough, given that there are elaborate commentaries and various versions of Gita available? If we go by the google search or the dictionary meaning, we would get into trouble. For eg; in Gita, the word “buddhi” is used as intelligence, knowledge and a means of knowledge. Atma is used with reference to body, some other places mind, some other places jiva and in other places as Atma (Self) itself. So we need an Acharya. He can explain what it actually means. 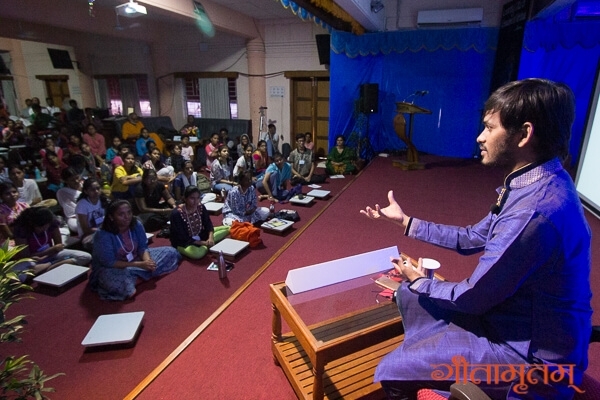 An Acharya is important in connecting various parts of Gita and putting it in right perspective. Guru is a must. 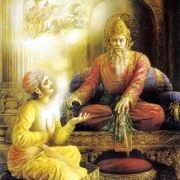 Arjuna was very cultured and intelligent. 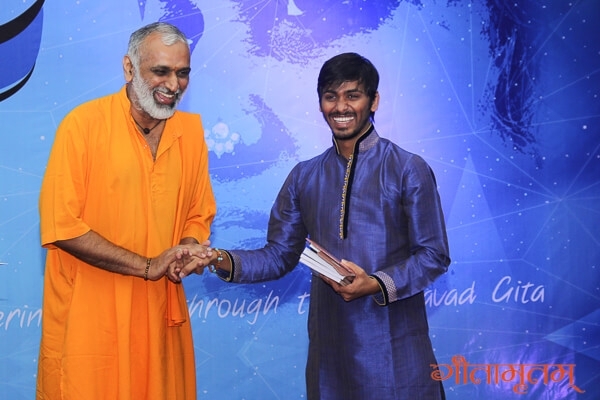 He had studied all Dharma Sastras. Sri Krishna was just removing the clouds of his mind so that the sun shine will be visible. 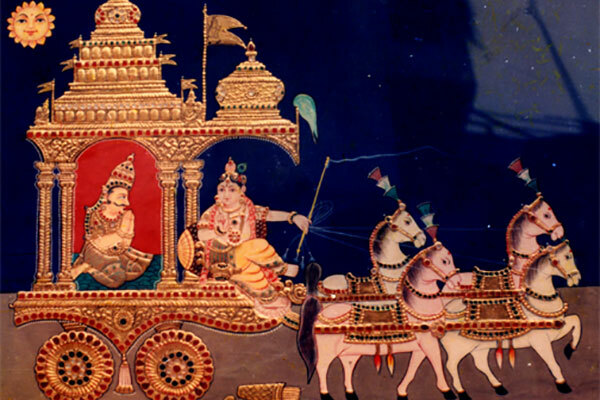 Arjuna raises so many questions, Sri Krishna answers all of them. While reading, many of us don’t even understand the question itself; forget about the answer of Sri Krishna. In fact at the end of the chapter Arjuna declares that he is doubt free and will execute his duty efficiently. After studying Gita usually we don’t even come to that level. 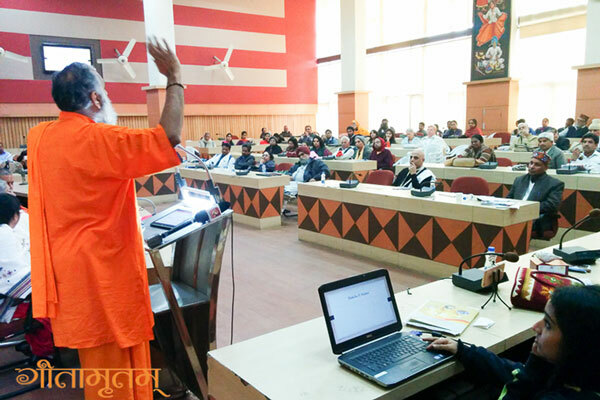 When there are questions about Gita, the Acharya can help us in properly understanding the question. Actually, the Acharya is trying to explain that which can’t be understood by the body, mind or intellect – which is beyond our recognition. There are hundreds of Mahatmas who have experienced this truth – in every century there have been many Mahatmas who have declared this truth to the world. A Guru who has seen more than what we could, will be able to correct our vision. A Guru who has seen the truth will be able to do that. With faith in the Acharya, we could try to follow the path shown by him/her. For example, in order to show the moon, the Acharya will point his finger towards the white light at night. 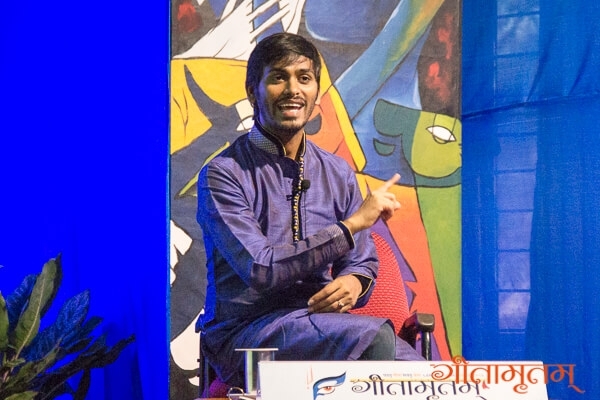 The child may not understand what he is pointing to, but the Acharya will remove all his doubts and take his gaze towards the goal. Similarly, Gita and Sastras are pointers to this truth and we have to go beyond the words by tuning to the Guru. 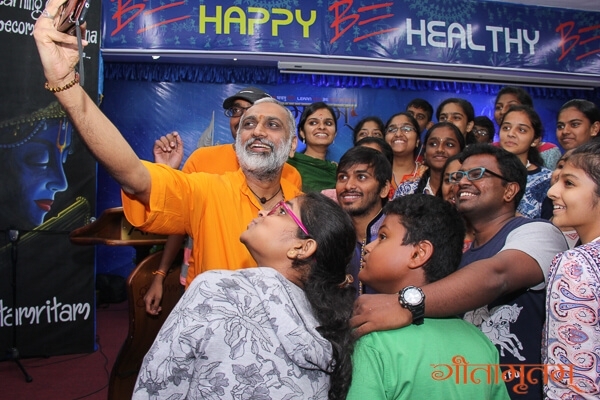 Every Acharya explains in his own style, which is his own freedom, but Gita remains the same. 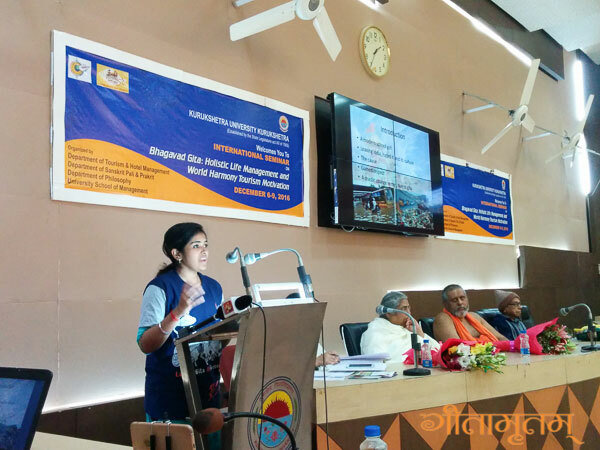 Gita supplies the message to everyone – child, parents, sanyasins or anyone for that matter. 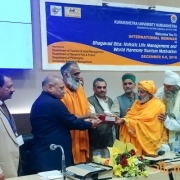 In the study of Gita, the enquiry should be ignited. When enquiry comes, Guru will be there to guide. 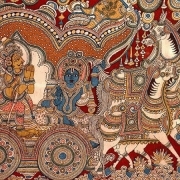 https://www.gitamritam.com/images/gita-cloth-art.jpg 450 600 Sanjaya https://www.gitamritam.com/images/gita-weblogo.png Sanjaya2016-11-07 00:31:282019-01-11 17:47:20Isn’t learning Gita from book or Internet is enough? 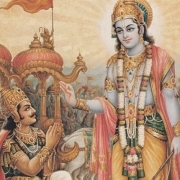 Do we pass or get job by learning Gita? NO. A job is not assured even after graduating, doing post-graduation and so on. 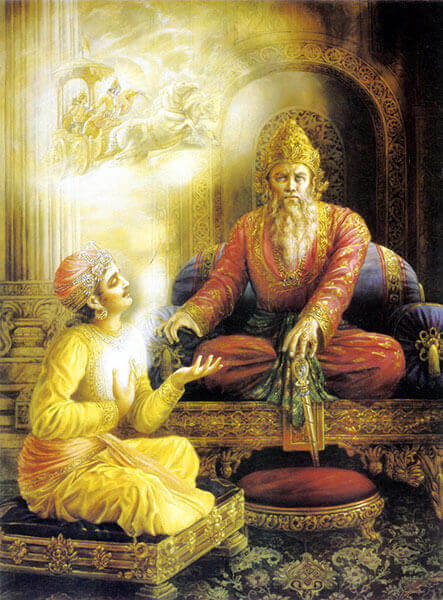 The purpose of learning Gita is not to get a job. Only if you study you will get marks. Only if you pass you will be placed on job. In that process even if you fail or you get one or two marks less than you expected, you will not commit suicide if you have the wisdom of Gita. 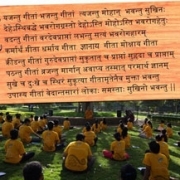 The benefit of learning Gita is how to do the job properly and efficiently in a relaxed way. All with a smile. Then success shall be yours. 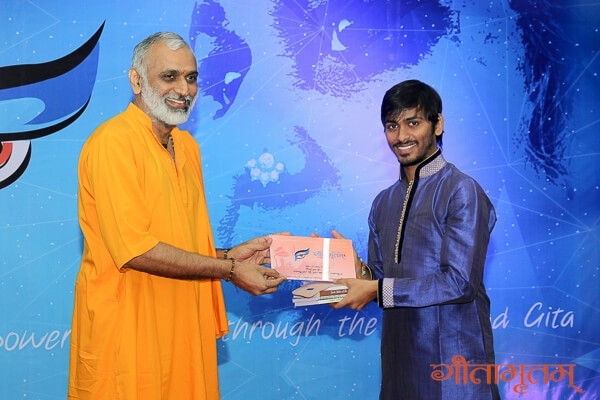 https://www.gitamritam.com/images/gita-win.jpg 430 600 Sanjaya https://www.gitamritam.com/images/gita-weblogo.png Sanjaya2016-11-06 01:19:462019-01-11 17:47:59Do we pass or get job by learning Gita? This is another misconception people usually have about Gita. 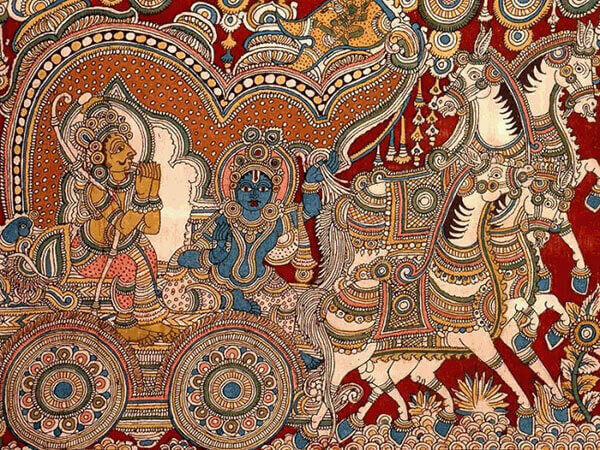 First of all, let us look at whom was Gita told to – Arjuna. Arjuna who wanted to achieve something in life, for which he had been preparing all along his life. 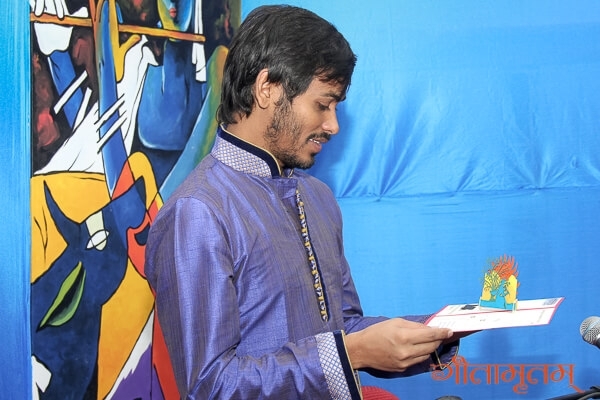 Gita was given to him and not for an old person. 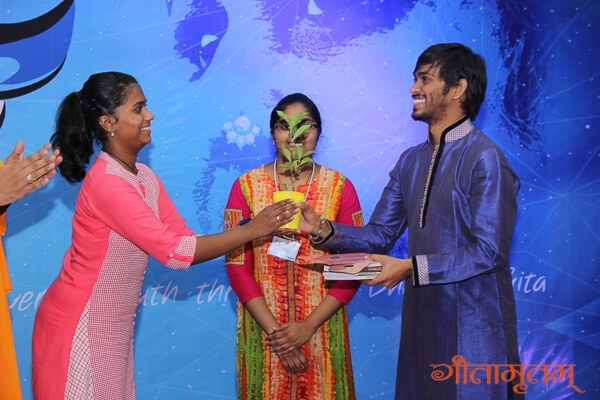 Gita was given to a person who wanted to achieve something in life and was ready to act for it. So, it is not for the old. 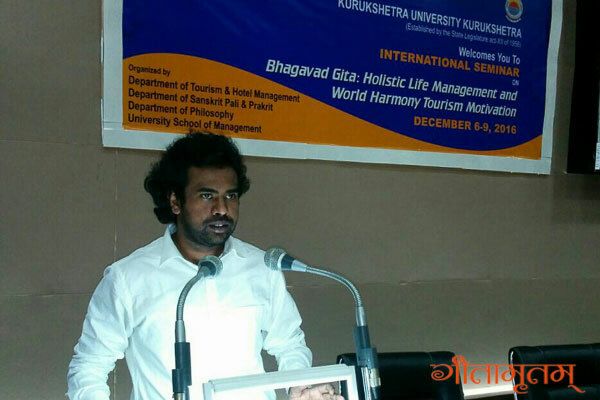 Upon learning Gita properly, we will understand that it is extremely useful in our day to day life. 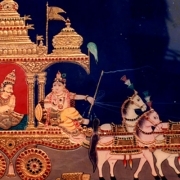 Gita is not an old Sanskrit text that you need to by-heart and read. It is a set of values, principles and instructions which when followed, one becomes successful in life. You may have great dreams and passion in life that you want to achieve. In the process you would have to face many difficulties. People who supported you might turn against you. The friends might turn as enemies. You might lose all your wealth or meet with an accident, even worse lose your health completely. In life, when these situations arise, how will we pursue your goal? What are the things to keep in mind to still pursue that passion? These are the subjects of discussion in Gita. Old man Drutarashtra also heard Gita, nothing happened to him. His sorrow was not removed. For Arjuna, he could remove the sorrow and ultimately became victorious. You argue it’s for the dead? NO way. They cant hear anything, they are dead. It will not help them at all. 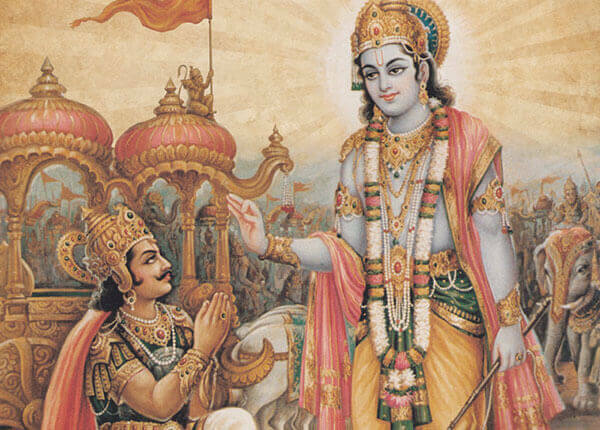 Gita is for the one who is living, not for the dead. Spiritual knowledge is only for the living. Whatever you cannot achieve when you are alive, you cannot achieve after your death. Sastras is very clear on that. When our breath stops, and desire remains, that is Death…. When our desires stops and breath remains, that is Moksha” !!! 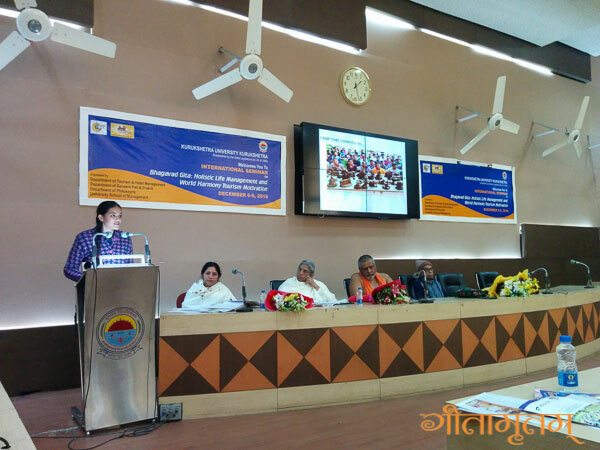 Why should we learn Gita which is an old textbook? Bhagavad Gita is not a textbook. Even though it is printed and published by Sage Vyasa, it deals with the eternal values one must have in life – certain do’s and don’ts. It is an instruction manual for all human beings. It teaches us how to deal with the objects of the world and people, its nature and limitations. When we buy a new machine, we always get an instruction manual which describes what all it can do, how to operate it, under what conditions it will operate in an effective way, etc. If we do not follow these instructions, it can even damage the machine. Similarly, Gita is the manual for living. Human body and mind are the apparatus given to us. We must know what is mind and what is body and we should also know how to operate them to utilize it in the most effective way to reach the highest in life. 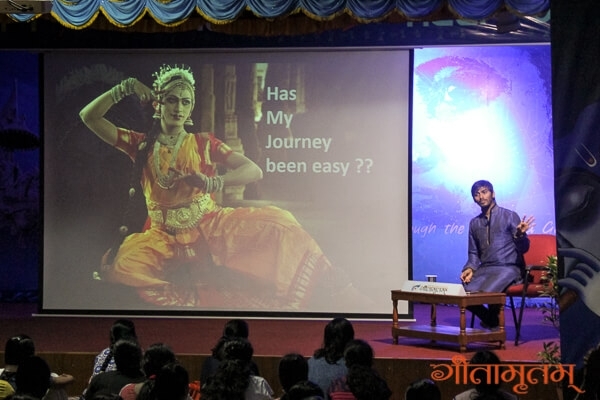 Gita teaches us how to live in this world which is filled with challenges and diametrically opposite situations of life like victory – failure, loss – gain, pain – pleasure, birth – death. In such a situation, how do we live peacefully and lead a happy life? Gita deals with this subject. Gita is not old. It’s fresh. 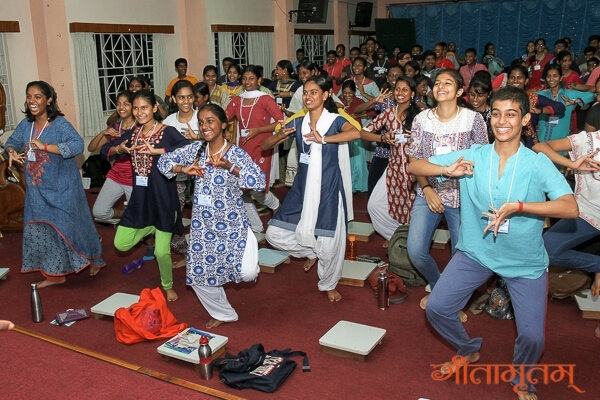 By learning Gita, we will be able to handle all the situations of life in a better way. Face and handle them – all with a smile. 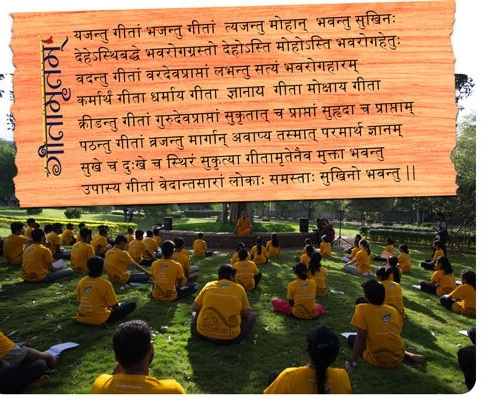 https://www.gitamritam.com/images/geeta-upades.jpg 400 600 Sanjaya https://www.gitamritam.com/images/gita-weblogo.png Sanjaya2016-11-06 00:31:282019-01-11 17:49:19Why should we learn Gita which is an old textbook? Human beings want to be happy as long as they are alive. Even after death we want to be happy. 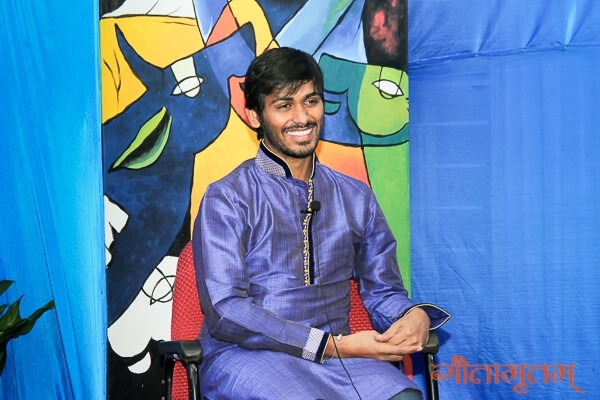 Gita deals with the subject of what is happiness, how to remain happy even in the midst of challenging situations. Like we use google maps (gps) to reach a destination, if we have Gita Practising System (GPS) we will be able to reach the destination easily. 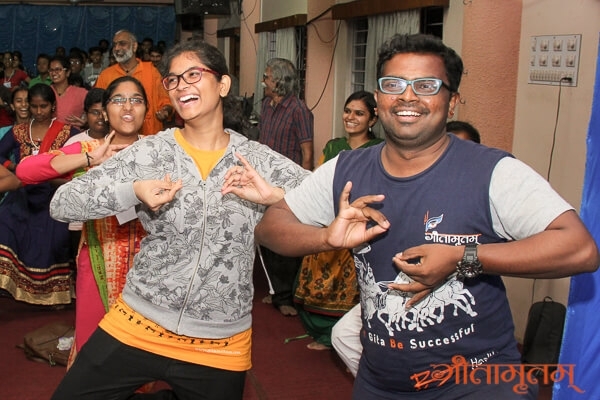 Gita is like a road map of happiness. Arjuna was not happy in doing his duty as a warrior. He realised that even if he gets the kingdom without any enemy and without any borders, or even the kingship of heavens, that will not make him happy. Irrespective of the preparations for the war all throughout his life he realises that it is not the goal of his life. That was his question. “How can we be happy killing my own people? 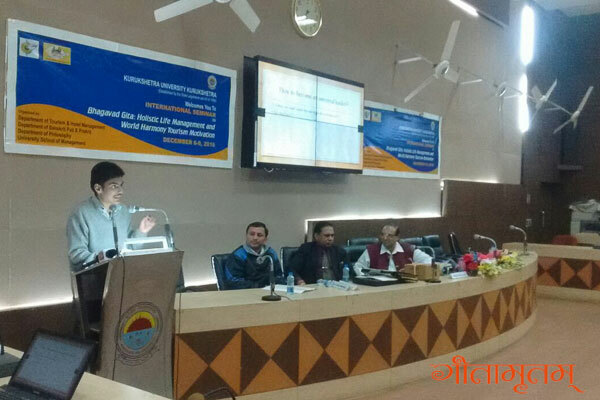 (कथम् सुखिनः स्याम माधव ?) Oh Lord please show me the path to permanent happiness. I seek your help. Please guide me” (यत् निश्चितं श्रेयः स्यात्, तत् मे ब्रूहि । अहं ते शिष्यः । त्वं प्रपन्नं मां शाधि ।). Arjuna understood that by his action he was neither happy then nor will he be happy in the future. In the past also the Pandavas had had only sufferings. So how to be happy was his question. Hence Sri Krishna’s answer is in those lines. The answer to finding permanent happiness is the Bhagavad Gita.